Americans pay a third as much for mobile and use twice as much data. Wireless providers make more revenue off of Canadians than people anywhere else, a new survey has found. The predictable result? Canadians have among the lowest rates of mobile data usage, among 32 countries surveyed by Swedish telecom consultancy Tefficient. 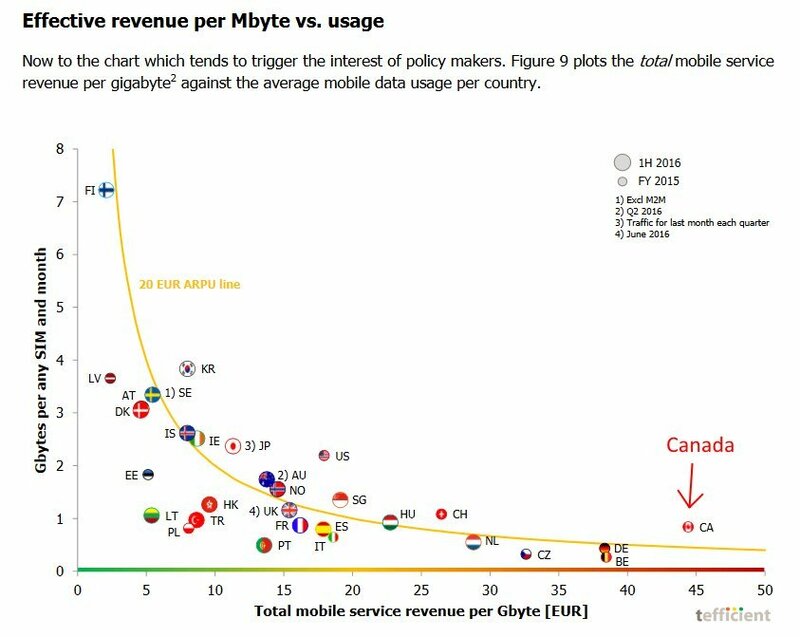 “The most expensive mobile data countries are Canada, Belgium, Germany, Czech Republic and the Netherlands and — as a consequence — mobile users in these countries are using very little mobile data,” Tefficient said in its report. On average, Canadian telcos make around $60 per month per mobile subscriber, compared to less than $21 per month per subscriber in the U.S. The average American mobile subscriber uses twice as much data per month as the average Canadian. Telecoms may believe that they can make up for low data usage by charging more for data, but that could lead to a “downward spiral where operators alienate customers [and] find that their mobile behaviour is more and more Wi-Fi centric,” the report said.